I have to admit, I had never cooked potato cakes before. Last fall, I ran across a recipe for them which included corn and scallions plus sour cream topping. I thought it looked good. I quickly learned potato cakes can be more difficult to form than a crab cake. But if you use your spatula, you push it together once everything gets hot. I think the real success of this recipe is the sauce. I just put a light shrimorror on top and it was perfect. In a small bowl, mix sour cream and 2 T. scallion and refridgerate. In a large bowl, mix the potato flakes, cornmeal, garlic salt and paprika. Add the milk, corn, cheese and remaining green onions; mix until blended. Shape into patties. Heat a large nonstick pan on medium and coat with cooking spray. Cook patties in batches for 2-3 minutes on each side or until golden brown. Serve with sauce. 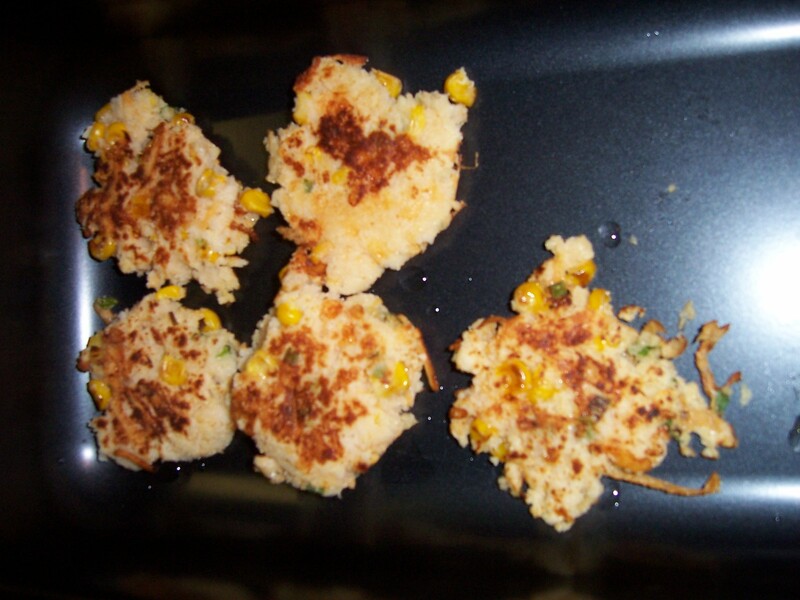 I halved the recipe and I still got about 20 corn cakes. Since you aren’t cooking the sour cream, this is a situtation where you can use fat free sour cream. My sister isn’t much of a cook. I laugh when we cook together because she takes her time to mix and dice everything just perfectly. But when my sister comes across a recipe she really likes, she gets the recipe and makes it. I hope you enjoy this tasty cheese ball at your upcoming holiday events. Soften cream cheese. Combine ingredients. Cover with shredded cheese. Chill to harden before serving. Serve with assorted crackers. I’ve used the Carl Budding Beef to make this recipe. It is way cheaper than dried beef and taste the same. To reduce fat, used fat free or reduced fat cream cheese and fat free cheddar cheese. You aren’t cooking it so you don’t have to worry that.